Italian painter. Although he only started painting quite late, Novelli went on to become the most important Sicilian painter of the seventeenth century. One of his seminal influences came from studying the works Caravaggio had left on the island, particularly his Adoration of the Shepherds. 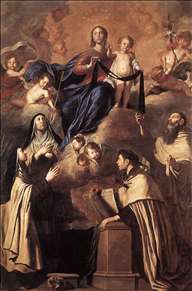 Novelli also felt the influence of the Genoese school (especially through the paintings at the Oratory of Santo Stefano) and above all Anthony Van Dyck, who had been present in Sicily in 1624. These currents would persist throughout Novelli s career. After working for a while in Palermo, just after 1630 Pietro Novelli set off for Naples and Rome. 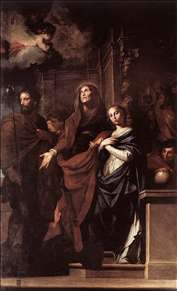 In Rome he was particularly receptive to Bolognese classicism and neo-Venetian Roman painting, while in Naples he drew on his experience of Caracciolo, Stanzione and Ribera, as well as his contact with the classicising naturalism developed by Andrea Vaccaro. He took on board the example of strong chiaroscuro from Ribera and incorporated it into his own style which became self-assured and very personal. This can be seen from the two canvases about St Benedict in the abbey of S. Martino alle Scale in Mondovi. By now he was the best-known artist in Sicily and certainly the most in demand. He traveled the island incessantly, alternating paintings with plans for fortifications, architecture, jewelry designs, and stage scenery. Among his most important work, we should mention the decoration of the presbytery and apse in the cathedral at Piana degli Albanesi which was commissioned by the Greek community. 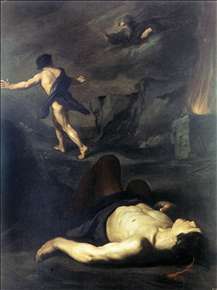 See more details about "Cain and Abel"
See more details about "Our Lady of Mount Carmel"
See more details about "Marriage of the Virgin"